YOTEL Boston would like you to meet their new member of staff, a robot called YO2D2. The high-tech hotel chain, inspired by first-class air travel, is well-known for its innovative approach to accommodation. The Seaport hotel, which opened in June 2017, boasts a self-check-in app and bedrooms with a modern “cabin” aesthetic with adjustable SmartBeds and interactive Technowall. If you’ve stayed in a YOTEL before in either an airport or one of their inner-city based lodgings, you’ll be familiar with their futuristic appreciation of comfort and use of space. Their unique butler, YO2D2, has been programmed to support guests needs with the ability to safely navigate crowded spaces, autonomously call for the elevator and shuffle down the halls to music. 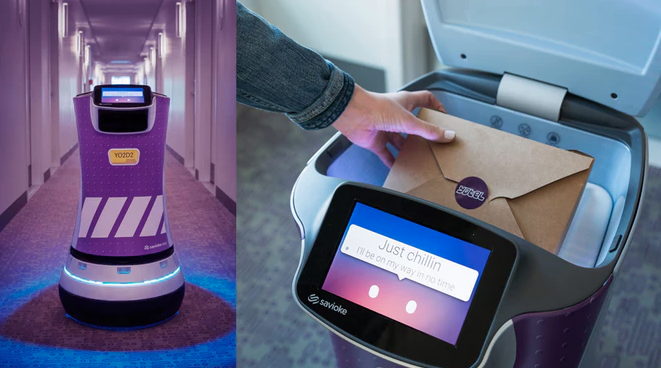 The friendly crew member does not need to be tipped and happily delivers room service after being summoned from “Mission Control,” YOTEL’s front desk. The 36”-tall robot cannot talk, but it can chirp and interact with people and environment around him, like his Star Wars namesake. YO2D2 can communicate with guests via a smart touchscreen interface. With access to the hotel’s high-speed WiFi, YO2D2 can self-navigate the hotel and independently head to the recharging bay. 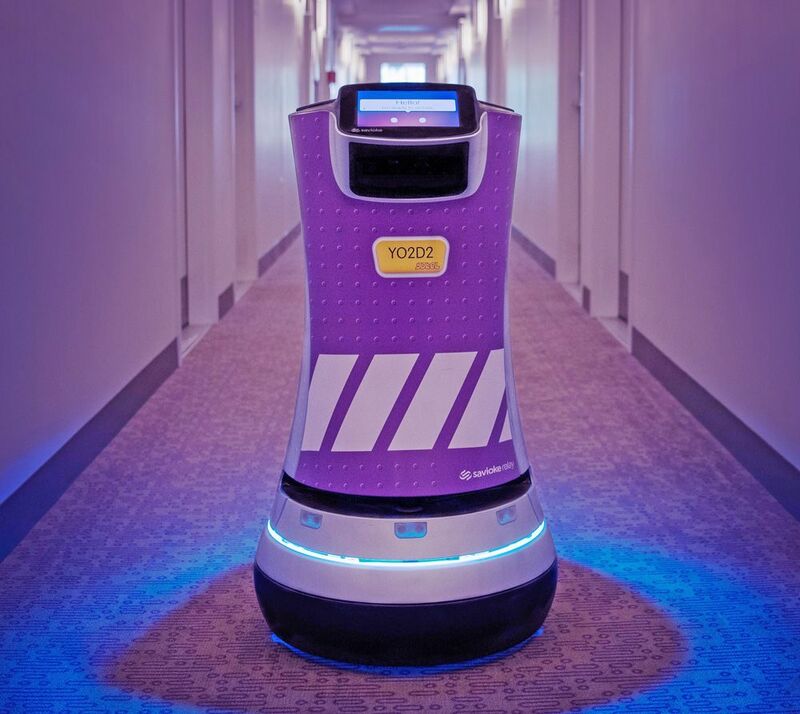 YO2D2 is not the first robot the company has employed, YOTEL in New York has a luggage storing helper named YOBOT and the Singapore branch has the newly appointed Yoshi and Yolanda who zoom around the hotel delivering room service. YO2D2 seems like a welcome addition to the YOTEL team as general manager Christopher Hartzell remarked. The Boston-based robot was designed by San Jose, California-based company Savioke. Savioke develops robots that work in human environments with the core focus of service.